I’m always a little bummed when Labor Day arrives and brings an end to summer, but then I remember the good news – football has finally returned! Lounging around all weekend, going to tailgates and attending watch parties can make it hard to eat healthy, but I try to take the challenge as an opportunity to create new versions of typically not-so-healthy foods. Today, I’m sharing an easy twist on fried chicken that will totally satisfy your finger-food cravings. Rinse the chicken and then pat dry. If you are using chicken breasts, cut into 1 inch thick strips to make tenders. Whisk the eggs in one wide, shallow bowl. In another bowl, mix the coconut flour and spices. Take each piece of chicken and coat it with egg, let excess drip and then dredge it through the flour mixture until completely coated. Place these pieces on a new plate, put on your apron and you’re ready to fry ’em up. Heat the coconut oil over medium-high heat on the stove in a frying pan. For some extra flavor, I love to add a tablespoon of bacon grease to the oil. You’ll know the oil is ready when you add a piece and it sizzles. Add 3-4 pieces to the pan and let it sizzle for 3 minutes per side. Work in batches so the oil stays hot…. once those 3-4 pieces are done, you can add the next round. Once you remove the chicken from the frying pan, place it on a baking sheet (best to add parchment paper underneath for easy clean-up). If you made chicken tenders, they are likely ready to eat right-away, but thicker cuts, especially those bone-in, may need some time in the oven to finish cooking. Use a meat thermometer to test so you don’t overcook. I usually put drumsticks & wings in a 325 degree oven for just 5-10 minutes. This fried chicken is crispy, tender and flavorful with just a bit of kick. Plus, it is gluten-free, paleo and full of health benefits from the coconut oil it’s fried in! 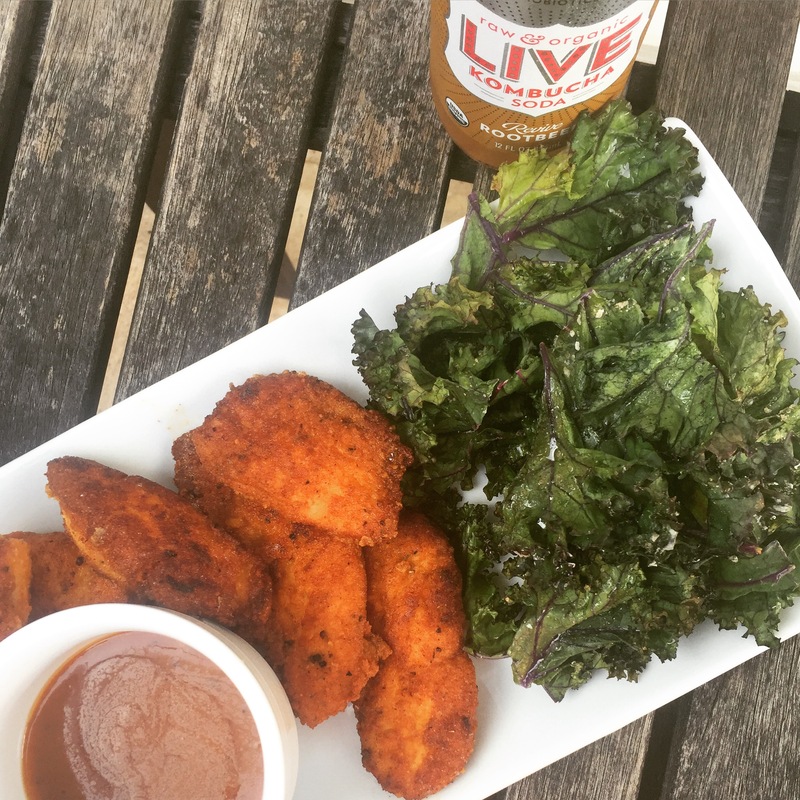 Best served with an ice cold kombucha & kale chips… Enjoy!